Are you maximizing your morning coffee? What better way to start the day than with a cup of high quality coffee that you don’t even have to work for? If you’ve been using the same old simple coffee maker of the old days, you’re missing out big time! If you want the smell of fresh-brewed coffee wafting in the air as you slowly wake up, the Cuisinart DCC-3200 is perfect for you. 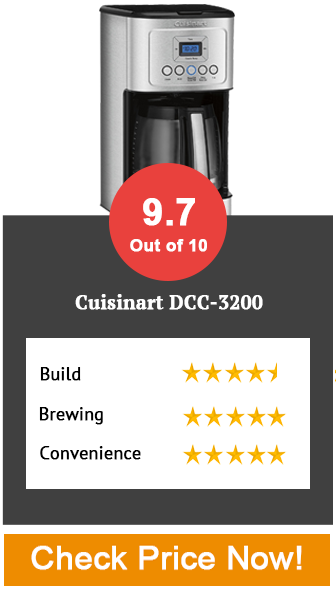 The DCC-3200 by Cuisinart is a low-maintenance coffee maker that produces a serious cafe-quality cup of joe. It’s sleek and slim with a design to match modern appliances, making it a perfect fit for almost any kitchen. The brew time is quite short, only needing about 5 minutes to brew 8-10 cups, and since it is fully programmable, it’ll be done by the time you make it out of bed anyway. Cuisinart has designed this coffee maker to optimize both the water flow and the temperature to maximize the taste of your coffee of choice. The key feature of the Cuisinart DCC-3200 is the hands-off brewing and cleaning. You can program the coffee maker to turn on and start brewing at whatever time you’d like, and it is even self-cleaning. Better yet, you can even program it to turn itself off after a period of time. You don’t have to brew, don’t have to clean and don’t even have to turn it off. To be able to forget about all of those added steps in the morning is essential when it’s already hectic getting ready for work or school. With the DCC-3200, you can pour yourself a cup of coffee mid-brew without the spout continuing to release coffee. The Brew Pause technology is essential for the busy family in the morning who would like to pour their cup whenever they’re ready. With the brew strength control settings, you can choose between a regular or bold flavor. This gives you the benefit of brewing for whatever the day has ahead of you. If you’ve got a particularly tough day ahead, you might need a stronger kick from a bold coffee. Set the warmer to the temperature you always want your coffee to start at. Now you don’t have to wait for your coffee to cool down at all, and no more dreaded trips to the microwave if your current coffee maker isn’t brewing it hot enough for you. The Cuisinart DCC-3200 is a great choice for anyone who wants a hassle free yet high quality cup of coffee to start off the day. You can simply set it and forget it. This coffee maker is equipped with all of the latest technology so that you can specify exactly what you want from your coffee and the machine will even clean itself and thank you for the opportunity. (Well, almost). If you’re in for a budget coffee maker the Cuisinart DCC-3200 is definitely one to watch out for. It comes with convenient features like hands free brew and cleaning, a drip free spout that helps avoid mess, adjustable warmer temperature Control and lastly brewing strength control for an early morning boost.